For other uses, see Warner (disambiguation). 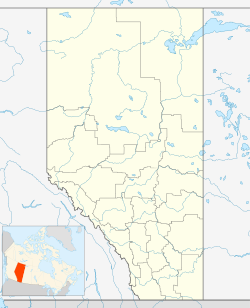 Warner is a village in southern Alberta, Canada. It is located in the County of Warner No. 5, approximately 65 km south of the city of Lethbridge. Warner is a farming community. Warner is situated at the intersection of Highway 4 and Highway 36, about 38 km north of the Montana border and Interstate 15. Warner's nearest neighbours are the towns of Stirling and Milk River. The village is home to the Warner Hockey School, one of the premier girls' hockey schools in Canada. It is also home to the Devil's Coulee Dinosaur Heritage Museum. In the 2016 Census of Population conducted by Statistics Canada, the Village of Warner recorded a population of 373 living in 172 of its 196 total private dwellings, a 12.7% change from its 2011 population of 331. With a land area of 1.16 km2 (0.45 sq mi), it had a population density of 321.552321.6/km2 (832.815832.8/sq mi) in 2016. In the 2011 Census, the Village of Warner had a population of 331 living in 161 of its 190 total dwellings, a 7.8% change from its 2006 population of 307. With a land area of 1.15 km2 (0.44 sq mi), it had a population density of 287.826287.8/km2 (745.466745.5/sq mi) in 2011. The population of the Village of Warner according to its 2011 municipal census is 392, a 2.3% increase from its 2007 municipal census population of 383. The Devil's Coulee Dinosaur Heritage Museum features a Hadrosaur (duck-billed dinosaur) nest and embryo, ancient fossils, dinosaur models, located in the Warner. The Warner elevator row is a row of historic wood-cribbed grain elevators. A total of six elevators still stand in a row from south to north alongside the Canadian Pacific Railway on the east entrance of the village of Warner. Due to the loss of a vast amount of Alberta's many grain elevators, the elevator row in Warner remains the very last row of elevators in Alberta. Only one elevator row remains in Canada, the elevators in Inglis, Manitoba. The Galt Historic Railway Park located 1 km north of Stirling is another popular museum which displays of life and travel in the 1880s to 1920s are set up in the restored 1890 North West Territories International Train Station from Coutts, Alberta, Canada and Sweetgrass, Montana, USA. The station was moved to the current location near Stirling in 2000 and is added onto every year. Future plans to move the 1925 Ogilvie grain elevator from Wrentham for display along the station in the 36-acre (150,000 m2) park is still in the planning stages. Stirling Agricultural Village is a National Historic Site of Canada, and was listed as one of only three communities in Canada designated as a National Historic Site because of the community’s well preserved settlement pattern that follows the Plat of Zion model. Located within the village are two museums the Michelsen Farmstead a totally restored 1900s home showcasing rural life in Alberta in the 1930s. Listed as a Provincial Historic Site in 2001, and the Galt Historic Railway Park. Waterton Lakes National Park is a National Park located in the extreme southwest corner of Alberta, Canada, 40 km west of Cardston, and borders Glacier National Park in Montana, USA. Waterton Lakes was Canada's fourth National Park formed in 1895. The Rocky Mountains rise suddenly out of the rolling prairies in the park. Amid the peaks are the three Waterton Lakes, carved out of the rock by ancient glaciers. Writing-on-Stone Provincial Park, is one of the largest areas of protected prairie in the Alberta park system, and serves as both a nature preserve and protection for the largest concentration of rock art, created by Plains People. There are over 50 rock art sites, with thousands of figures, as well as numerous archeological sites. ^ "Location and History Profile: Village of Warner" (PDF). Alberta Municipal Affairs. October 21, 2016. p. 604. Retrieved October 23, 2016. ^ a b Village of Warner. "Devil's Coulee Dinosaur Heritage Museum". Archived from the original on 2007-07-29. Retrieved 2007-08-02. ^ "2011 Municipal Affairs Population List" (PDF). Alberta Municipal Affairs. October 5, 2010. Retrieved January 12, 2011. ^ Parks Canada (June 2007). "Village of Stirling National Historic Site". Retrieved 2007-11-13. ^ "Michelsen Farmstead". Village of Stirling. Retrieved 2017-09-14. This page was last edited on 21 July 2018, at 02:48 (UTC).